The Cottage at the Inn on Crescent Lake is a large private bungalow that offers a feeling of warmth and tranquility to anyone traveling to the area or those looking for a reasonable vacation rental for their Missouri getaway. The building originally served as the estate’s carriage house, and for a time, horses were stabled within its walls. It now is a romantic two-story bungalow that will be your “home away from home.” The first floor includes a kitchen, dining area, a tile-topped breakfast bar, half-bath, and cozy living room. 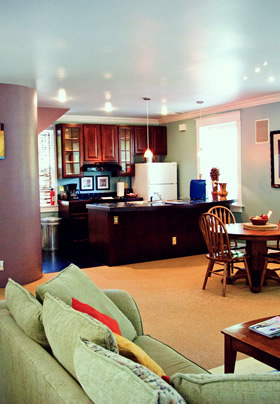 Kitchen amenities include a microwave, coffee maker, and full-size refrigerator. (Please note: To maximize guest safety, no cooking capabilities are available in the Cottage.) 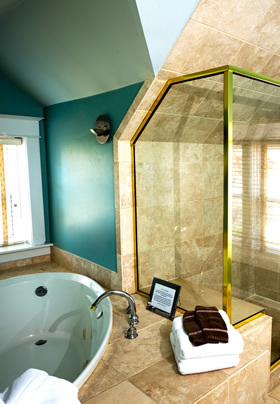 The second floor features original hardwood floors, a king-sized bed, sitting area, an oval two-person Jacuzzi tub, and custom walk-in shower. Each level offers a TV, with a DVD player on the first level. The Cottage overlooks the inn’s crescent-shaped ponds and is mere steps away from the boat dock. Guests who stay in the Cottage may choose to have breakfast delivered at no additional fee or be served breakfast in the Inn’s sun-drenched solarium. Please note: When more than two guests occupy the Cottage, they will be served breakfast in the mansion. For those seeking privacy, beautiful surroundings, or a romantic getaway destination, the Cottage is the ideal spot. As always, luxury is at the forefront at the Inn on Crescent Lake! 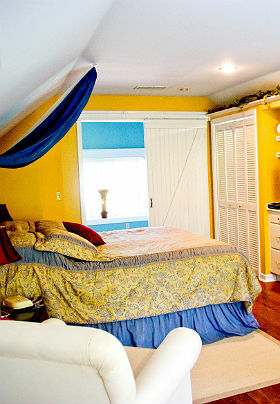 *Based on 2 guests (can accommodate up to 4). Add $30 per night for each extra guest.